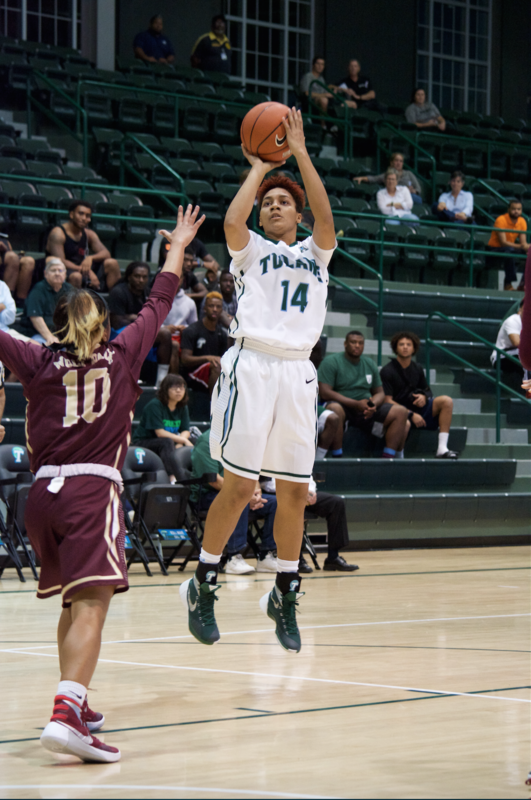 Freshman guard Taylor Emery shoots over sophomore guard Zoie Miller for a two pointer to contribute to Tulane’s win in her first Green Wave appearance against Loyola New Orleans on Nov 5 in Devlin Fieldhouse. Anything you can do they can do better. Tulane women’s basketball, under the helm of head coach Lisa Stockton, is the strongest athletic team the Green Wave has; yet it is also one of the more underappreciated teams. Women’s basketball is often ignored while the men’s basketball team receives significantly more attention but, based on records, the women’s team is a much fiercer competitor. Last season, the team finished with a record of 22-11, 11-7 American Athletic Conference, tied for fifth overall in the conference. It also made it to the semifinals of the AAC women’s tournament, where it lost to South Florida 69-78, but that did not get the players down. Tulane also received the last at-large bid to the NCAA Women’s Tournament. Though the team lost 47-57 in the first round to Mississippi State, unlike the men’s team the women at least made it to the big dance. Despite the women’s success, the men’s team still received more attention and fan attendance even with a 15-16, 6-12 AAC record and no postseason conferences. The Green Wave used its success from last season as inspiration for its exhibition game, starting off its campaign on a high note and proving early on that you cannot stop them. With a 96-48 debut in an exhibition game against the Loyola Wolf Pack on Nov. 5 at Devlin Fieldhouse, high standards have been set for the season which will without a doubt be met, if not exceeded. In the first appearance of this season, sophomore guard Kolby Morgan, junior guard Leslie Vorpahl and freshman guard Taylor Emery all recorded double-digit points as well as scoring 45.8 percent from the field. The Green Wave started off down 16-6 at the 3:54 mark of the first quarter but did not let that deter it, producing a 13-4 run ending the quarter as well as scoring another 29 before the half. The naysayers who look down on women’s basketball or think the team cannot outplay the men’s team just fuel these girls’ fire. There is no doubt this team will prove itself and be a force to reckon with. This season will be challenging from the start, as five of the six opening contests are against NCAA tournament teams from last year, but the Wave is ready to take any competition head on. The Green Wave official season kicks off at 5:30 p.m. Friday against Arkansas-Little Rock at Devlin Fieldhouse.